How to prepare for JEE Main 2018? JEE MAIN 2018 Study Material Download Section Study Planner for JEE Exam Papers, Most noteworthy, download the following important Exam question paper pdf for preparation JEE Main 2018 is an important exam to procure a seat in top engineering colleges like 31 NITs, CFTIs, IIITs and other government colleges. Also, Joint Entrance Exam (MAIN) is an eligibility exam for Joint Entrance Exam (Advanced). CBSE released the notification along with admission process for JEE Main 2018 JEE Main 2018 Exam Pattern, Counselling, Seat allotment and Admission Process details here . • Conducting body: CBSE – Central Board of Secondary Education. • Colleges: More than 1000s of engineering colleges in India including 31 National Institute of Technology (NITs), CFTIs and IIITs. • Stage: This First stage for JEE Advanced for Indian Institute of Technology (IITs) Admissions. • Application form release (jee main form 2018): 01 December 2017. • Whereas, admission in IIT is solely depended on the JEE Advanced All India Rank. How to prepare for JEE Main 2018? 1. The aspirants should make a proper study timetable. 2. And the candidates must have a look at syllabus and examination pattern. 3. In addition, the students should be well-versed with the topics from Physics, Chemistry, and Mathematics of Class 11th and 12th. 4. And, a good command over NCERT books is essential to score good marks in the examination. 5. whereas, the applicants should also practice questions from past year question papers and mock tests to analyze their preparation and also know about the difficulty level of the examination. 6. Time Management is as important as other parameters. 7. Therefore, relieving stress and maintaining the health is also equally essential. The details of jee mains counselling process are described here. CSAB / JoSAA will conduct JEE Main 2018 Counselling for admissions to IITs / NITs / IIITs and CFTIs. Whereas the candidates will get the admissions on the basis of their All India Rank and their preferences and number of seats available in participating institutes. And participation in counselling and seat allocation process is compulsory for the candidates to get a seat in participating engineering colleges. In addition, Many colleges who are not part of Counselling but offer admissions on the basis of the performance in JEE Main Exam. And accepts JEE Scorecard. So, the aspirants need to apply for those counselling directly. This year also the JEE Main 2018 pattern remains the same. And the pattern of jee follows two papers in which paper 2 is optional for B.Arch aspirants. And the question paper will check the deep knowledge of participating candidates. So the students need to be industrious and have to put forth hard labour. Furthermore, though it can be tackled wisely and smartly as well. As a result, conceptual erudition is what is required. Consequently, In JEE Main Exam Pattern there will be two papers conducted on the same date. The applicant can apply for both the papers. The Paper 1 is for B.E/B.Tech Engineering. And most of the students appearing in JEE MAIN opt for Paper 1 only. • Mode of Exam: Paper one will take place in both the modes i.e. Online (CBT) & offline (PBT) mode. • Subjects: Paper 1 contains Physics, Chemistry & Mathematics. • Type of Questions: Only Objective type MCQs will be asked from Physics, Chemistry & Maths. • Total Marks: 360 Marks. • Duration of Exam: The time duration of exam is 3 Hours. • Marking Scheme: Candidates will get 4 marks for each correct answer. • Negative Marking: 1 Mark will be deducted for each wrong answer. The Paper 2 is for those candidates who desire to pursue a career in B. Arch. andB. Planning. • Mode of Exam: Paper two will take place in offline mode only. • Type of Questions: The Mathematics & Aptitude test paper will contain objective type questions. whereas Drawing test will be subjective and based on sketching. • Number of Questions: There will be 30 objective type questions in Mathematics section. 50 question will be from Aptitude test section. And the paper contains two (02) questions of drawing test. • Total Marks: Thus comprising of 390 overall marks. • Marking Scheme: 4 marks for each correct answer. JEE Mains 2018 syllabus is prepared by the exam conducting body i.e. CBSE. And, the syllabus is based on 10+2 board Physics, Chemistry and Mathematics. Whereas, PCM syllabus is given here. Moreover, topics taught in 11th and 12th of CBSE, ICSE and State Boards are included. So, it is important for admission seekers to prepare from both (XI and XII) class syllabus. 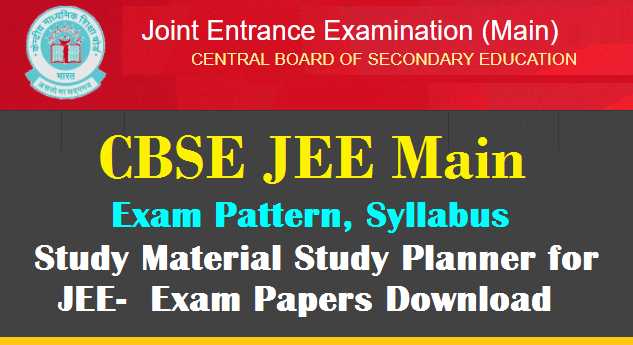 Download New Syllabus pdf of JEE Main 2018 Here.